I bailed out of the office last Thursday for a couple of days with Laura Murray in the Twin Cities. It is always wonderful to spend time with my creative friends, and this trip was great fun. Laura and I met author and contemporary quilter extraordinaire Susan Stein for lunch on Friday, then headed South for a visit with the ever-adventurous Shelli Ricci. Shelli served up a real treat — an unexpected play day! She has been experimenting with Kraft-Tex, from C&T Publishing, and she generously offered to help us dye up a couple of rolls — right then and there. Now that is some serious play! I have to admit I was skeptical that we could do this in her kitchen without making a royal mess, but I was more than a little bit wrong. All we needed was wet Kraft-Tex, hot water, vinegar, Rit Dye, plastic bags and shoe boxes and a microwave oven. We put two pieces of Kraft-Tex in each dye bag, one white and one tan. And if we did not like the results, we folded them up again and put them back in the microwave for another shot. I was dumbfounded that we could actually dye up a wide range of colors so fast and with so little fuss. No chemicals (other than the bottles of Rit Dye), no buckets, no rinsing fabric for half of forever. I am so accustomed to the dye process being more complicated and time consuming, that the simplicity of the process caught me totally off-guard. Since when did anything get this easy? 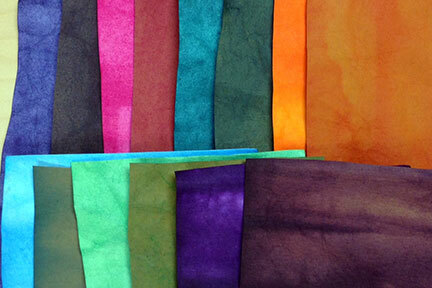 On Saturday morning, Laura and I hauled our stash of colored Kraft-Tex down into her studio for a quick Paintstik test. Laura successfully added a couple of stenciled images, but I was more interested in finger-painting. I doodled on a piece of purple Kraft-Tex with several Paintstiks, then smudged and smoothed the colors with my fingers. Oh yes, this has tons of possibilities! Laura took one look at my painted Kraft-Tex and started pulling goodies from various bins and drawers. A couple of silk scraps, a few shapes painted with her Leaf Medley stamp and a bit of embossed Angelina appeared in a flash. If it had not been time to leave, we could have whipped up a mixed-media piece in no time! When Was Your Last Play Day? When was the last time you treated yourself to a play day? Or the last time you were totally surprised by how simple something could be? I would love to hear your thoughts here on the Blog or over on our Facebook page. Kraft-Tex is a heavy paper product from C&T Publishing. On the packaging, they say it “looks like leather, but sews, cuts, and washes just like fabric.” Washing definitely makes the product softer and more leather-like. It can be stitched by machine, but not by hand. Shelli Ricci dyes both wool and Kraft-Tex using the instructions provided by Judy Coates Perez for Quilting Arts TV. Series 1300, Episode 1303-2 Dying Wool Felt for Appliqué. Was researching how to make faux leather yesterday. p erfect timing for this article. Thanks again. I really like what you’re doing with the Kraft-Tex but can you please tell me what it is as I’ve not heard of it before. Many thanks Ann……??????? Hi Ann, Kraft-Tex is a really tough paper product that can be washed, dyed, stitched, painted on, you name it. I have only begun to experiment with it, but I think it would make a wonderful base for mixed-media projects. There is a link at the end of the article that will take you to C&T Publishing. I expect there is a lot of information on their site. We just had a play day with Rit dye and fabric and microwaves yesterday. Such fun results and Colorado. Have never tried Kraft-tex though. Where do you get it? Hi Diane, I asked my local quilt shop owner to order the Kraft-Tex for me. (It’s always good to support your local shops…) There is a link at the end of the article that will take you to C&T, and I’m sure it’s available online if you don’t have a local shop that will order it for you. 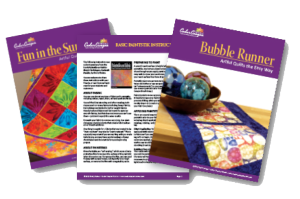 Get access to member-only content in the Cedar Canyon Community Center, including free patterns, tip sheets and online course previews. 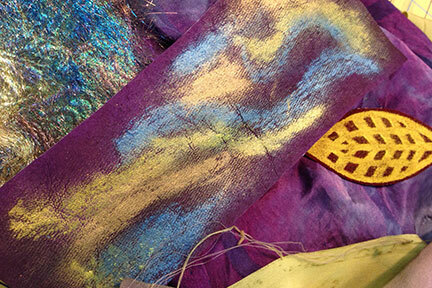 You’ll also receive weekly tips and inspiration in the Fabric Art Magic newsletter.